Bran is the hard outer cover of the berry and protects it from the elements. It is an excellent source of fibre. Germ is the part of the grain that would become the plant if cultivated. It is removed in the milling process to prevent the flour to becoming rancid more quickly. Endosperm is the food that the seed would consume to become a plant. The flour that we use for baking, unless it is wholemeal, has had the germ and the bran removed. The Miller's job is to break open the grain, to separate the bran and endosperm, and to grind it into a finished product. The system should not be thought of as simply an industrialised version of stone milling. Under the traditional method wheat is ground in a single operation. Thereafter the various elements must be separated out from the milled stock. The roller system seeks to separate elements at progressive stages in a 'gradual reduction'. This requires a series of rolls all performing slightly different actions on the stock, between which a range of sifting and screening devices extract the flour. The roller method retrieves a greater proportion and superior quality of fine white flour. Some early experiments were made in Europe around the middle of the century, notably in Budapest. Through the 1880s Britain and America began major technical advances, quickly surpassing the labour-intensive methods still used elsewhere. In Britain the development was given impetus by imports of wheat and flour. America and Austria-Hungary enjoyed strong wheats which yielded strong flours and provided well piled, bolder loaves. British millers, hindered by a wetter climate and less reliable harvests, increasingly obtained their wheat supplies from overseas. American wheat became the principal supply; then American flour imports threatened to dominate the British market. Millstone methods were unsuitable for processing the stronger, harder imported wheats and this prompted the rapid development of British roller mill systems. The first tentative small plant was installed in 1878. The subsequent progress became a revolution, with surges of application during 1882-1885 and 1888-1893. As the demand for whiter flour spread across the country, mills were confronted with the choice of trying to survive producing a lower grade product or investing in roller technology. Capital, suitable buildings and access to flour markets determined who could continue, and many mills were forced to close. Some smaller mills survived until the middle of the 20th century but the industry eventually rationalized into the few giant milling companies which dominate the market today. The roller mill has not only provided the consumer with whiter, well shaped loaves, but a whole range of bread supplies at incredibly low prices. Henry Simon was the technical leader of roller mill development in Britain. He was born in Silesia in 1835, studied engineering at Zurich and practised in Europe. In 1867 he took an office in Manchester as a consulting engineer with the avowed intention of finding an industrial process to specialise in. It was probably his European connection that led him to specialise in roller mills. Henry Simon died in 1899 but his company continued as an important player in the development and manufacture of roller systems through the most of the 20th century. Henry Simon Ltd amalgamated with a major competitor in 1988, which was in turn taken over by the Satake Corporation of Japan in 1991. 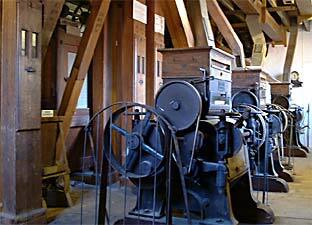 Roller mills have been frequently ignored by historians and often shunned by mill societies. This is mainly because traditional stone milling blends better with the 'Heritage' landscape where most mill enthusiasts dwell. It nevertheless seems strange that issues which concentrated the minds of so many mill owners have been of so little concern to those who record their story. Past experience suggests the passage of time will eventually bring wider recognition to the technological achievement and enterprise of the roller mill revolution. Sadly, by then, most of the archaeology will have gone. The British transition from traditional stone milling to roller mills began in the 1870s. It was to revolutionise flour making and establish the technology in over 1000 mills. When local mills closed we lost nearly all those roller mill installations. With only a handful left, the Isle of Wight is fortunate to have at Calbourne Mill what is probably the earliest example. This report covers the story of Calbourne's roller mill and an outline description of the processes involved. There were three mills recorded around Calbourne in the Domesday Book of 1086. Particular reference to Upper Calbourne Mill appears in 1299, with a detailed record of ownership from the 16th century. Flour may therefore have been milled on the Upper Calbourne site for over 1000 years. The mill is now a working museum, demonstrating the stone mill in operation during the summer months and still producing stoneground flour. George Weeks acquired Upper Calbourne Mill in March 1878. He came from a family of millers but had pursued a career in accountancy. Calbourne signalled his return to the trade and he also acquired the mills at Southford, Ford and Towngate, Newport. He purchased the roller mill in 1893 in the light of public demand for roller quality flour. The plant was designed and manufactured by Henry Simon of Manchester, a pioneer of British roller mill design. It had been specifically devised by Simon to suit the country mill and was more compact than most installations. Apart from a superior flour, the two main gains from roller production were increased output and a greater extraction of white flour. The Calbourne plant was rated at 1.5 sacks per hour compared with around 0.5 sacks from the stone mill, with an increase from about 50% extraction of potential white flour to 72%. Whilst the system was aimed at the smaller mill, the investment necessary to purchase a roller mill was considerable and would have required a turnover at the upper end of an inland mill to support it. The other Island roller mills were larger port mills with the facility to ship flour to the mainland. Calbourne's trade was limited to the Island but it had a substantial market in West Wight, also extending as far east as Cowes and Newport, and to Ventnor in the south. The key factor was probably their contracts to supply military establishments at Parkhurst and elsewhere. The payment method indicates the potential strain on capital in that it was split between an initial down payment, regular repayments and a percentage of sales paid to the roller mill supplier, Henry Simon Ltd. The main plant consists of six pairs of rolls housed in three roller units and three main pieces of dressing equipment. Each piece of dressing equipment has two or more units within providing varying degrees of its process. There are 3 roller units each housing 2 pairs of rolls, giving 6 pairs in all. Each pair perform a different action on the stock passing between them. The rolls in each pair run at different speeds to achieve a drag effect. There are 3 pairs of break rolls and 3 pairs of reduction rolls. Break rolls are fluted along the length at an angle with each pair having varying degrees of pitch and depth. These are designed shear and break the wheat rather than crush it. Reduction rolls are smooth and mill down to different degrees of fineness depending on gap setting between each pair. The tin lined wooden shafts coming into the top of the units deliver the stock to each set of rolls. Processed stock is carried up to the second floor in cups running in the vertical lifts at the rear of the units. The equipment here receives the stock transported up from the various roller actions and carries out different separation, purifying and screening processes before sending it back to the next set of rolls, or as finished product to the ground floor. There are three main devices. A pair of slow running conical sieves which receive stock from the break rolls. The sieve separates out the various elements of the broken wheat for further treatment. The stock is dragged over the sieve by a loose chain. The purifier separates out unwanted material by both weight and size. The stock runs along on a vibrating sieve passing over currents of rising air. The sieve permits some heavy parts to fall through while other parts are suspended in the air in layers determined by their weight, the lighter dust and bran carried away while the remaining stock drops back down into trays. Stock is passed to the sieves from the reduction rolls. A set of four rotating drums throw the stock through a silk screen filter by centrifugal force (photo at left shows a single sieve unit without its silk screen covering). Each unit has a unique effect on the stock depending on its speed and the gauge of the screen. The wheat berry is delivered to the first break rolls where it is broken up into chunks and passed to a scalper to sift and separate the endosperm from the outer bran. The larger pieces are returned to the next set of break rolls and second scalper to repeat the process, and again through the third break rolls. Each pass subjects the stock to a gradual reduction. During this process the endosperm is separated into intermediate sized middling and semolina via a centrifugal sieve on the roller floor (BMS unit - not illustrated), and sent to the purifier to remove impurities and any lighter bran particles. The purified stock then passes through the first set of reduction rolls which mill it before sending to a centrifugal sieve to have a degree of fine flour separated. This process is repeated through another two sets of reductions rolls. Each milling makes the stock progressively finer and this is matched by finer gauge centrifugal screens. Flour begins to be extracted about half way through the process, delivered to the ground floor with the separated bran and offal. The various routes different elements travel between rolls and dressing units makes for a complex flow chart. The diagram below gives a much simplified view of the process. 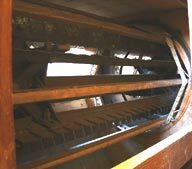 It is not difficult to imagine the leap in technology the roller mill would have presented to the miller and his staff. They well understood their product and the principle of some of the dressing machinery but most of the equipment would have been completely alien to them. Even after a period of training, the range of operations and working parts would have probably presented some teething problems. Nevertheless within a short space of time output was exceeding the plant's rated value by producing nearly 2 sacks per hour. The roller mill was designed to be driven by the existing water wheel but the difficulty of achieving sufficient regular power by this method arose early in the installation. A three cylinder 'Trusty' oil engine was installed to supplement water power at the outset. With an output of 20hp it approximated to the water wheel under full bore. There is no record of the ratio of use between the power options but water was free so they would have used the wheel whenever possible. The oil engine must have had its shortcomings because within a few years it was replaced by a steam engine. Once in full production, the roller system produced the mill's complete white flour output. The stone mill was still operated but only for animal feed. Although roller technology underwent considerable development in the 20th century, the Calbourne equipment appears to have run its full working life with very few adaptations. In 1920 the steam engine was replaced by a gas suction engine. The more economic fuel might have encouraged a more liberal use of motor power, particularly as it could run the plant at a higher rated output, but the water wheel was still occasionally used right up to the end of the roller mill's working life. The plant ceased full scale production in 1955. Today the plant is still in full working order although the absence of some perishable items, such as silk screens, prevent it processing stock. There is not sufficient space around the equipment to run it for public view and this unfortunately means there is no specific reason to run it at all. Nevertheless the present mill owners have an enthusiastic interest in the roller mill so its medium term preservation is assured. Our thanks to Calbourne Miller, Neal Smith, for invaluable technical guidance.